I missed celebrating my first anniversary as I was in Spain for work. There can’t possibly be a way to compensate for that, but I wanted to take off, reset myself and spend some quality time with the husband without going bankrupt. North East of India and Bhutan were top on the list, sadly, it is monsoon there now. The next option was Bali, followed by Thailand. We zeroed in Thailand finally after considering budget and the places to visit. We’ve already been to Mauritius and indulged in a few water sports, so we were clear about what we wanted to do in Thailand. Our aim was just to relax and leisurely explore a new place without rushing in and visiting all the places. This vacation was somewhere between being a traveller and a tourist – a vast improvement from our Mauritius trip where we did just the touristy stuff. Being a “traveller” is not easy no matter how romantic it sounds. Planning a vacation all on your own without using the services of an agent can be daunting. The downside, however, is the lack of flexibility to explore and experience the destination fully. Leading a machine life with 10 hours of work with 2 hours of commute literally leaves us with no time and patience to plan and execute a proper vacation. Yet we didn’t want to miss out on experiencing the place. Thus we decided to go ahead with a travel agent. After much deliberation and little research we could manage, we decided to zero in Pickyourtrail – the start-up travel company which fit our bill. We contacted the Pickyourtrail team via their chat feature on their website. The partner available gave us a call and listened patiently to our expectations and suggested various options before going on to create a login for us to customize the trip via their planner online. The online planner was the jackpot for us. It let us customize the trip by letting us pick hotels, flights, places and activities. We decide to visit Krabi and Bangkok – Krabi because I wanted beach and peace, Bangkok because the husband wanted to! The other options were Chiang Mai, Ko Samui, Pattaya, and Phuket. Pattaya was out of the question – not really the ideal place to relax and I was in no mood to party. Phuket – Too crowded and mainstream for my taste. Chiang Mai and Ko Samui didn’t attract me at all. Krabi sounded peaceful and it was indeed peaceful. Now to the itinerary builder tool. There were various options to pick from based on the interests – as in the builder had options to pick if we wanted to party or enjoy nature or do cultural sightseeing etc. Then it gave out suggestions of places to visit and things to do. We played around and customized it before freezing and booking our trip. Here are some pros and cons of the builder tool. 1. We had complete control over the itinerary. We picked what we wanted to do. 2. This meant more time to explore on our own which also proved to be cost effective. 3. Options of hotel and flights were just too good we didn’t have to worry about bookings at all. 1. The activities suggested were pretty conventional and standard – it was like a standard set which all tour operators offered. We had done enough research to know that. 2. The timing of the activities – This is one big issue we faced. We wanted to do things at leisure. The builder had a different time while the final itinerary mailed to us had a different timing for pickup and drop – we were set on the timings we picked and didn’t really notice the itinerary. We eventually had to rush for a couple of activities. The word ‘S̄wy’ translates to beautiful in Thai. It is the perfect word to describe Krabi. Dreaming of experiencing lush greenery, rocky terrain and dreamy beaches without wanting to go bankrupt? 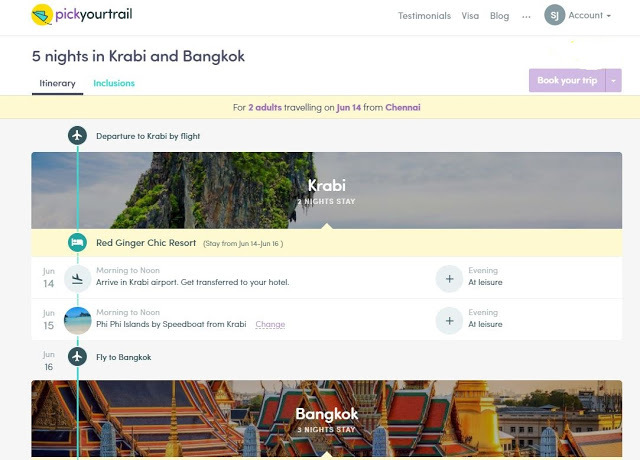 Krabi might just fit the bill perfectly. We picked this place over Phuket as it wasn’t as much crowded as Phuket. The month of June marks the beginning of the monsoon in Thailand. Thankfully for us, there were just mild showers and the sea wasn’t really rough but it was slightly choppy though. So if you are planning a trip from June to September, it would be wise to check the weather. Torrential rains are not a rarity in Thailand and hence it would not really be a pleasant experience. We picked the 1:10 AM Thai Airways flight from Chennai which landed in Bangkok’s Suvarnabhumi airport at 6:10 AM in the morning. Thailand has visa on arrival option for Indians. Do check the visa requirements beforehand as they do involve carrying a certain amount of local currency (Thai Bhat). Our travel agents – Pickyourtrail recommended that we obtain our visas beforehand. They guided us quite well with the documents that were needed to get the visa. One pro tip here – it is recommended to maintain a stable balance of minimum INR 40,000 at least for a month or so before you apply. We were warned that visa does get rejected if the transfers in and out of the account were erratic. That greenery was worth waiting 6 hours at the airport! Our flight to Krabi was operated by Thai Smile airways and departed from Bangkok by 1:25 PM and landed in Krabi by 2:45 PM. We decided not to do any activity in the evening and just explore the nearby area. We chose to stay at a modern and artistic place – a resort near the famous Ao Nang beach in Krabi – Red Ginger Chic Resort. We booked a superior room but were upgraded for free to a duplex suite which literally was so dreamy and comfortable. We spent the evening relaxing in the resort, soaking in the atmosphere, and ended our day with a perfect candlelight dinner. The food was way too good and there were surprisingly enough vegetarian options! Look at that water?! Isn’t it too good! Next day – On our itinerary was Phi Phi island. Given it was Ramzan and Krabi had a sizeable population of Muslims, our tour started a bit late. We got picked up by 10 AM and returned back by 5 PM. 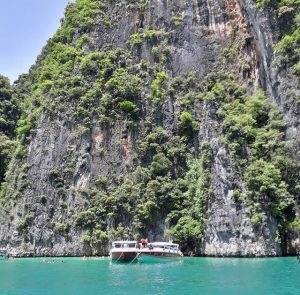 From the meeting point, we boarded on a speedboat and visited various spots including Monkey Islands, Phi Phi Don Island, Phi Phi Ley Island, and Viking Caves. All of them were typically dreamy beaches, blueish beautiful water with mountains nearby. We ended the day with a snorkelling activity. Lunch was included in the package. The beaches are so good and might be the best place to take a dip if you don’t know swimming. There is an entrance fee of THB 400 per person. Taking the speedboat might not be a good idea if you have backbone problems and motion sickness. If the sea is all choppy, be prepared for a rough ride on the speedboat. It was initially such fun as the boat went up and down, but after a while, you literally develop a headache with all that chopping feel of the rough sea. Snorkelling is a bad idea if you don’t know swimming because the currents are quite strong and it would be quite a task to stay afloat. The guide might know swimming but is probably no expert in teaching you to snorkel or to stay afloat. Towels, sunscreen, swimwear, waterproof bags – Absolute essentials. We spent the evening exploring Krabi, its night market and food scene. For a vegetarian, there were enough options available but most of them were not local to Thailand. Fruits, Indian, and Italian plus pancakes from roadside shops were the real saviours! Do make it a point to eat the Dragon fruit which is abundantly available there. They are so yum and make for a good snack. We woke up late the next day and explored the beach nearby before heading to the airport for our next destination – Bangkok. We decided to skip shopping in Krabi as Bangkok is a better destination to shop. There are two airports in Bangkok – Don Muang (DMK) and Suvarnabhumi. Low-cost carriers such as Air Asia use the DMK airport which is really crowded. Suvarnabhumi airport was quite large when compared to DMK airport. So take care if you opt-in for a low-cost carrier. 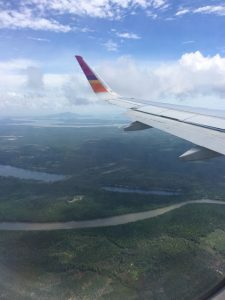 Thai Smile airlines – They messed up with our food from Bangkok to Krabi. It was such a bad experience – We had opted for vegetarian which wasn’t updated in their system and we ended up having just a bottle of water instead. It was lunch time and we were quite hungry. The 6-hour transit was just boring thought we just lazed around in the airport and munched on snacks. Remember to avoid such long transit times, we felt that we should have done our research better. One day in Krabi is not enough to explore the whole place. Since we really wanted to visit Bangkok, we opted just for a day, but no regrets as we felt very relaxed by the time we landed in Bangkok. Food ought to try for a Vegetarian – Dried candied Banana, Tom Yum (Ask for the vegetarian version, it has such a different flavour), Roadside pancakes – These are different from traditional pancakes. In short, Krabi was such a relaxing place with dreamy beaches and lush greenery! After that relaxing stay in Krabi, we boarded a flight to Bangkok. We picked the Thai Lion flight which landed by afternoon in the Don Muang airport. This is the point in the trip when we experienced our first major difficulty. To plan your own Thailand vacation, click here.